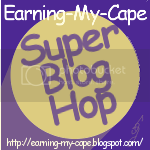 Earning-My-Cape: My First Blog Hop! I just signed up for Simply Linked, and I want to try it out. Wanna try it with me? How about a Blog Hop? I'll keep it simple, since it's my first one and I don't know much about Simply Linked yet. ...and click on at least 3 other links in the hop and check out their awesome sites. Eddie, no problem! I'm still learning how to do the whole blog hop thing, so I will just leave it as it is. Thanks for following my blog, Worst Mom Ever, and thanks for the invite to the link party! I'm following you now too. I'm eager to read more. It's great to meet you! I'm so glad you joined in the bloglovin blog hop. I'm following via gfc and bloglovin. I also host a weekly link on Wednesdays and id for you to stop over and link up your latest projects. Oh this is great. Perfect blog networking. There's so many ways to follow a blog now it gets confusing. How do you find things like this on bloglovin'?